The necks of your trusty and tipsy correspondents were not the only things baking in the sun at the Great Canadian Beer Festival; the culture of the festival itself stewed in the heat. Beer Fest is a mash of surreal pop culture references and graphic tees; consuming a steady stream of 4oz. samplers was all we could do to convince ourselves to embrace the weird enclosure of the Royal Athletic Park on Saturday, Sept. 12. Pilsner Doehnel, Driftwood Brewery (Victoria): A crisp, fruit tinged Pilsner. A great simple style to start the day with. More rounded flavour profile than a normal Pilsner and free of the usual lager-like aftertaste that typically keeps some away from the style. Disruption IPA, Category 12 (Victoria): Gold-medal winner of the Black IPA category of the 2015 Canadian Brewery Awards, this beer was cask-conditioned and even more flavourful than the half-dozen bombers your correspondent has had before. Its smooth fennel flavour dominated the palate. Patrick O’Pumpkin, Central City Brewing (Surrey): Sweet and flavoured less like pumpkins and more like pumpkin pie, this ale was heavy on taste and well-suited to the four-ounce-sampler format. Nectarous Sour, Four Winds Brewing (Delta): Sour as they come, this pale, peach-coloured beverage was a refreshing break from the heat and lingering weight of the pumpkin ale. This liquefied, hopped-up fuzzy peach, while delicious, couldn’t shake the truth that it was super weird. It was around this time that two patterns emerged from the crowd: capes and pretzel necklaces. The capes were odd, but only because so many different groups of people had just one caped member in their ranks. There were dozens of them in every direction; we felt we were missing something. The pretzel necklaces — while their function was evident — were something we assumed were being sold at the event, but we slowly realized people were making them at home. One quick search online reveals that this drunk, German cousin to the candy-necklaces of our youth is modus operandi at beer festivals. BYOPN. The next 16 ounces of beer samples flowed easily. Brett Sour, Strange Fellows (Vancouver): Light on sour, and therefore quite quaffable, this pale beer is another testament to the beautiful marriage of sour beers and sunshine. What we really enjoyed was how the flavours were so perfectly delicate that one could imagine having a pint or two without getting tired, but also without getting bored. Bomber IPA, Bomber Brewing (Vancouver): One of your correspondents bought a spcity but disappointing pizza from Ali Baba’s (the lineup was short) and needed an IPA to pair with it. Bomber’s IPA is a West Coast IPA through and through. No issue was found with it, it helped the pizza taste better, but it also isn’t breaking any ground. Midnight Sun Espresso Stout, Yukon Brewing (Whitehorse, Yukon): Without a doubt drinkable, and different from most other coffee stouts out there, this beer had the spirit of an iced Americano in the same way that Phillips’ Longboat Chocolate Porter channels the spirit of a glass of chocolate milk. Just A Little Bitter English Bitter, Cumberland Brewing Co. (Cumberland): The name says it all: it’s just a little bitter. It’s OK, but not a favourite of this style. Things started to blur around the edges at this point. Heat stroke or intoxication both seemed a little unlikely but ultimately plausible at this stage. 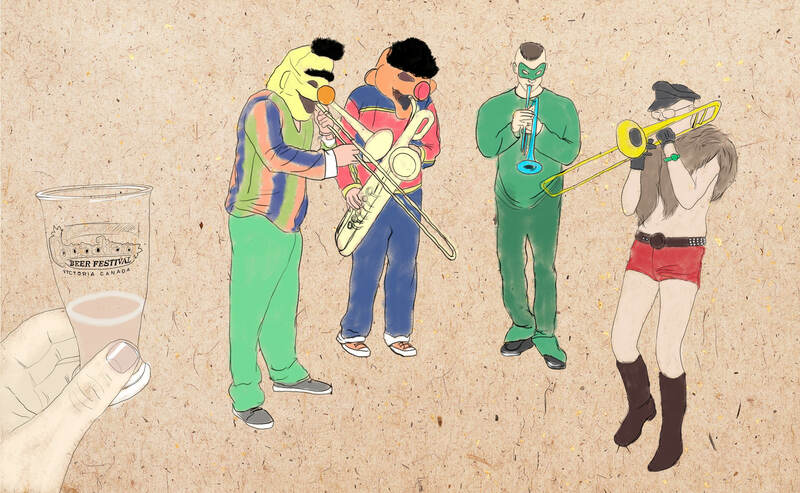 Two musicians in dilapidated Bert & Ernie costumes, playing baritone sax and trombone respectively, formed — with the Green Lantern on trumpet — a surreal, Saturday-morning-cartoon brass section. But it was around the time that a bearded man in a flannel frog onesie fetched the band beers that the strangeness of it all bled through. A man wearing an inflated, black sumo suit and Batman cowl (does that just make him Fatman?) bounced past on two-foot spring-loaded stilts. Someone could almost be heard saying, “We were somewhere around Barstow on the edge of the desert when the drugs began to take hold,” but we reminded ourselves that it was only Beer Fest, after all, and continued with the next round of samplers. Burnabarian, Dageraad Brewing (Burnaby): Described as a Belgian table beer, we knew we would not be disappointed. While some find Belgian styles too much to handle, especially in the dubbel or tripel variety, this brew had all the exciting notes of a Belgian beer while maintaining drinkability. If anyone could pour Belgian styles approachably, it’s the specialists at Dageraad. Red Brick IPA, Wolf Brewing (Nanaimo): Quite red in its flavour and colour, this beer didn’t feel like the “West Coast IPA” it advertised in brochure. Alas, what’s in a name? A beer by any other name would smell as sweet (and taste as bitter too). Red Pilsner, Steel & Oak Brewing (New Westminster): Flowing right into the theme of the previous beer, this selection from Steel & Oak was flavourful and balanced — great for anyone who is a fan of Pilsners or Red Ales. Intrepid Matcha Saison, Moody Ales (Port Moody): This tasted like any other saison. Still an OK beer, but your correspondents were let down by its promise of weirdness, a quality that — at this point — we were trying desperately to find. Apteryx IPA, Phillips Brewing Co. (Victoria): A lovely local note after a long day of sunburns and samplers. A true West Coast IPA from a brewery that helped define the genre. By the end of the day, we’d heard “Wagon Wheel” three times by two separate bands. We had seen four different iterations of the graphic-tee that shows a bear with antlers and labels it “Beer”. We also had the chance to sample 13 different beers; so, the whole event was an amazing success, and one that we will be certain to attend again next year. While you shouldn’t count on your correspondents to bring a cape or a pretzel necklace, next time we will pack sunscreen.